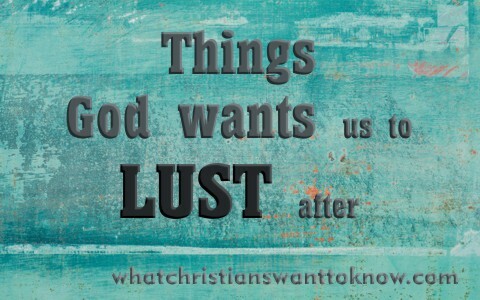 What Are Three Things God Wants Us to Lust After? When you think of the word “Lust” most people consider a good definition to be a strong sexual desire for something. Generally, lust is associated with sin as in “Lust of the flesh and lust of the eyes” (1 John 2:16). However, we can also see definitions like (noun) “a passionate or overmastering desire or craving (usually followed by for)” and (verb) “to have a yearning or desire; have a strong or excessive craving” . It is that strong yearning or desire that I want to point to when I say that there are three things that God wants us to lust after, and they are not sinful. Romans 8:5–9 For they that are after the flesh do mind the things of the flesh; but they that are after the Spirit the things of the Spirit. For to be carnally minded is death; but to be spiritually minded is life and peace. Because the carnal mind is enmity against God: for it is not subject to the law of God, neither indeed can be. So then they that are in the flesh cannot please God. But ye are not in the flesh, but in the Spirit, if so be that the Spirit of God dwell in you. Now if any man have not the Spirit of Christ, he is none of his. Galatians 5:22–23 But the fruit of the Spirit is love, joy, peace, longsuffering, gentleness, goodness, faith, meekness, temperance: against such there is no law. Ephesians 1:12–14 That we should be to the praise of his glory, who first trusted in Christ. In whom ye also trusted, after that ye heard the word of truth, the gospel of your salvation: in whom also after that ye believed, ye were sealed with that holy Spirit of promise, Which is the earnest of our inheritance until the redemption of the purchased possession, unto the praise of his glory. Ephesians 2:8–9 For by grace are ye saved through faith; and that not of yourselves: it is the gift of God: Not of works, lest any man should boast. Psalm 96:1–3 O sing unto the LORD a new song: Sing unto the LORD, all the earth. Sing unto the LORD, bless his name; Shew forth his salvation from day to day. Declare his glory among the heathen, His wonders among all people. Psalm 115:1 Not unto us, O LORD, not unto us, But unto thy name give glory, For thy mercy, and for thy truth’s sake. Romans 8:28–29 And we know that all things work together for good to them that love God, to them who are the called according to his purpose. For whom he did foreknow, he also did predestinate to be conformed to the image of his Son, that he might be the firstborn among many brethren. Ephesians 4:22–24 That ye put off concerning the former conversation the old man, which is corrupt according to the deceitful lusts; And be renewed in the spirit of your mind; And that ye put on the new man, which after God is created in righteousness and true holiness. Philippians 2:5–8 Let this mind be in you, which was also in Christ Jesus: Who, being in the form of God, thought it not robbery to be equal with God: But made himself of no reputation, and took upon him the form of a servant, and was made in the likeness of men: And being found in fashion as a man, he humbled himself, and became obedient unto death, even the death of the cross. 1 Peter 2:21–24 For even hereunto were ye called: because Christ also suffered for us, leaving us an example, that ye should follow his steps: Who did no sin, neither was guile found in his mouth: Who, when he was reviled, reviled not again; when he suffered, he threatened not; but committed himself to him that judgeth righteously: Who his own self bare our sins in his own body on the tree, that we, being dead to sins, should live unto righteousness: by whose stripes ye were healed. Lust can be a good thing, so long as you are lusting after those things that God wants you to lust after. He is worthy and because He saved us from certain death our desire should be to please Him, we should yearn to use our life to glorify Him and we should crave God’s word daily so that we know how to choose the things that allow us to become more like Christ. God is good, lust after His things! Previous post: What Are Some Of The Birthmarks Of Believers? Next post: Is Praying In Jesus’ Blood Biblical?